American adults have an incentive to choose work over higher education, because the national unemployment rate is expected to stay below 6% through 2020.That means competition for new students will heat up in 2016 and stay hot in the near term. Also, with the federal government’s new Gainful Employment regulations, it’s critical that colleges and universities, especially for-profit schools, demonstrate the effectiveness of their programs to the prospective students, as well as to government. Below are six tips to help higher education advertisers prepare for the seasonal peaks and connect with more prospective students. Education-related search volume on the Bing Ads Network has grown over the last year, especially during spring and fall semesters. Spring semester in particular is a key period, especially with people making New Year’s resolutions to learn something new or advance their careers. Traffic picks up again in August and September as the fall semester starts. Plan your campaigns and budgets to cover both peak periods. We have all heard the refrain “mobile first,” but for education-related searches, PC/tablet search volume still tops smartphone search volume. 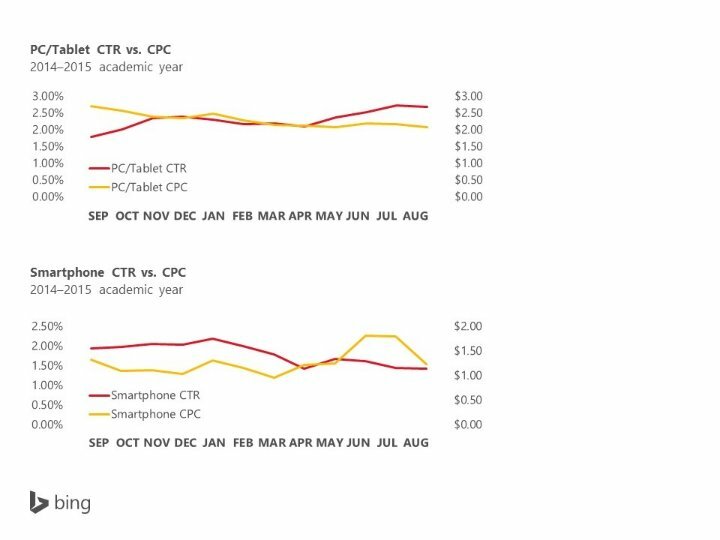 On the Bing Ads Network, PC/tablet click-through rate (CTR) increased over the 2014-2015 academic year as cost-per-click (CPC) decreased – providing better value for campaigns. That said, smartphone searches are on the rise now that more than 190 million Americans use smartphones – and 9 in 10 smartphone owners will use search. With increased adoption comes higher expectations for webpages designed specifically for smaller smartphone screens. In addition to optimizing your mobile campaigns, be sure your landing pages and website are also mobile-friendly. With the growth in online courses and degree programs, prospective students have more flexibility than ever. In recent years, this flexibility has drawn more traditional students (ages 24 and under) to online programs and the for-profit schools that offer them. In fact, students ages 24 and under now account for one-third of for-profit students. Half of online learners look for schools that are less than 50 miles away, and three-quarters of them contact less than three schools. Furthermore, 65% of online learners found search engines to be effective in raising awareness of online programs. It’s important for advertisers to get in front of prospective students early in the decision journey. Location targeting, location extensions, and call extensions can help you reach out to nearby searchers and build brand awareness. Ads for education providers perform best when the ad copy highlights promotions, such as “% Off,” especially in the ad title. These ad copies do well with ad descriptions that contain superlatives (e.g., “best” or “top”) or reference time (e.g., “year” or “month”). Other ways to grab your target audience’s attention and motivate them to click is by pairing % Off in the ad title with specific courses (e.g., “classes”, “program”, “certification”), or calls to action (e.g., “get started”, “enroll today”, “prepare”) in the ad description. For vocational schools, the highest performing ad copies were those tailored to searches by utilizing DKI (Dynamic Keyword Insertion) in the ad title, combined with programs (e.g., “program”, “programs”) in the ad description. Vocational school ad copies containing Jobs in the ad title also did well, especially with ad descriptions that contained specific types of careers (e.g., “design”, “nursing”, “culinary arts”, “project management”) or promises of further information (e.g., “info”, “information”) when clicked. Appeal to searchers concerned about the financial burden of vocational school courses by creating ads with types of careers in the ad title and financial aid related terms (e.g., “financial”, “aid”, “financial aid”) in the ad description. 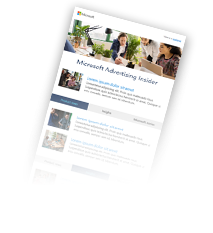 To make the most of your campaigns, take advantage of some of the tools offered by Bing Ads to give your ads greater impact. To streamline campaign management, set up Automated Rules to schedule and automate your campaign management operations. Use these rules to enable and pause ads, ad groups and campaigns, to adjust keyword and ad group bids, or to change a campaign’s budget automatically based on the criteria you select. You can also use the Notify Me rules to proactively monitor your budgets and performance. To highlight key information in your products or site, check out Sitelink and Enhanced Sitelink extensions. These additional links in your ads take people to specific pages on your website and can boost CTR by up to 13% over standard text ads. To help drive foot traffic into your local office, use Call extensions in conjunction with Location extensions, which can lift CTR by up to 10% and 20%, respectively. Your phone numbers will be displayed as well as directions to help customers find your business. And don’t forget to layer in location targeting to ensure optimal customer experience and the most relevant leads. To reach specific demographics, use Demographic targeting. Over the past year, Bing Ads has improved our demographic targeting with increased age and gender coverage to help you improve the chance of your ads showing to the demographic groups you want. To make the most of your higher-ed campaign, get to know the Bing Ads audience. Numbers show that about 34 million searchers used the Bing Ads Network – including 23 million unique searchers not reached on Google – for 119 million education-related searches, and accounted for 35% of all education paid clicks. Compared to Google, the Bing Ads audience is more likely to have searched for other literary or educational products online in the last 6 months, and is more likely to have applied for an education loan offline in the last 6 months. For more insights on our audience, visit our Audience Insights page. Interested in learning more? We’ve got more search trends and higher education insights in our Education presentation. For more seasonal and vertical insights, check out the Bing Ads Insights Portal. Feel free to ping us on Twitter, visit us to ask questions at the Bing Ads Answers forum, submit and vote on your top-priority features at the Bing Ads Feature Suggestion forum, or send us your feedback directly at BingAds-feedback@microsoft.com. IBISWorld Business Environment Report, National unemployment rate, June 2015. U.S. Department of Education, Fact Sheet: Obama Administration Increases Accountability for Low-Performing For-Profit Institutions, July 1, 2015.
 eMarketer, US Digital Users: Q1 2015 Complete Forecast, February 2015. IBISWorld Industry Report 61131b, For-Profit Universities in the US, Lucas Isakowitz, February 2015. The Learning House, Online College Students 2015: Comprehensive Data on Demands and Preferences, July 2015.
 comScore qSearch (custom), US, June 2015; industry categories based on comScore classifications. comScore Plan Metrix, US, July 2015, custom measure created using comScore indices and duplication. July data was used to reflect the month prior to the beginning of the education season.